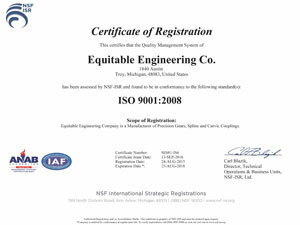 Equitable Engineering Company’s mission is to improve on a continuing basis our products and services to meet or exceed our customer’s requirements. 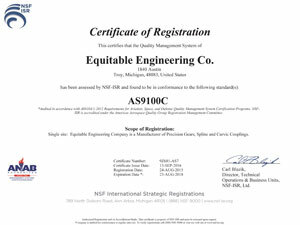 The Equitable Engineering Quality Management System is AS9100 and ISO 9001 certified because we know that a high level of compliance means a high level of excellence in all that we do. To facilitate great business practices, we employ principles of Lean Manufacturing and Six Sigma. Equitable Engineering utilizes two M&M gear checkers, Coordinate Measurment Machines and a host of inspection and test equipment in its two temperature controlled metrology labs in order to ensure accuracy up to AGMA Q15 tolerances for your flight critical hardware. All measuring and test equipment is traceable to the National Institute of Standards.